What's better than eating ice cream? Learning the science behind it! 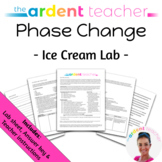 This pack includes the Ice Cream Lab where students can learn about phase changes as well as physical and chemical reactions while doing something fun and tasty. Answer key is included. All students love labs that involve eating! You cannot go wrong with this lab. It creates a practical learning experience. This packet includes: helpful tips to prepare, set up, and complete the lab, a materials list, three different versions of the lab, and an answer key. This is an exit ticket I use after students finish their Ice Cream Lab to ensure they understand why we made ice cream in science class and also to make sure they clean up their mess! Students learn how to make ice cream from scratch. 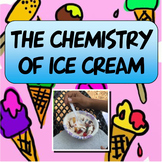 The ice cream is a great way to introduce solutions and liquid properties and about freezing point. Its fun, exciting and they will love it. 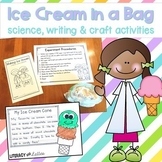 Lab instructions and note catcher/graphic organizer for making ice cream! 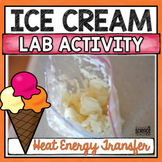 This is always a hit in my classroom (even when the ice cream doesn't completely solidify)! 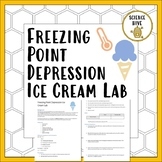 Students will explore colligative properties of solutions by determining how salt affects the freezing point of ice and calculating the freezing point depression. Students will also get to take advantage of this awesome colligative property to turn chocolate milk in ice cream. 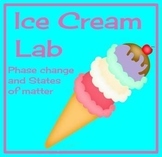 Is a simple hands on activity that will enable students comprehend the concept of Heat transfer. 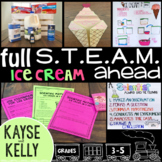 Bottom line, students use this concept to make their own ice cream. This is a quick lab that you can complete to show types of reactions and endo/exothermic reactions. HIGH SCHOOL CHEMISTRY - THE ENTIRE FULL YEAR COURSE BUNDLE! OVER 3000 PAGES! This is it! 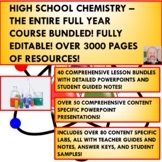 The entire full year high school chemistry course bundled into one, convenient digital download!Contains over 3000 pages!THIS BUNDLE INCLUDES TRIPLE RESOURCES - RESOURCES FOR A FRESHMAN CHEMISTRY COURSE, A REGULAR CHEMISTRY COURSE, AND A HONORS CHEMISTRY COURSE! A THREE FOR ONE PACKAGE!